Absolutely phenomenal. 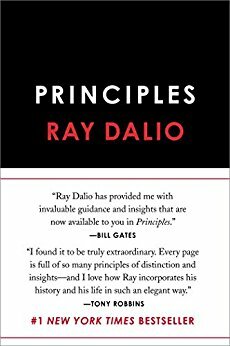 One of the best and most concise guides to creating an order and direction for your life, from the most successful hedge fund manager in the world. It’s short, you can get through it in one sitting, and come back to it regularly. Bad : Allow pain to stand in the way of one’s progressGood : Understand how to manage pain to produce progress“It is a fundamental law of nature that to evolve one has to push one’s limits, which is painful, in order to gain strength—whether it’s in the form of lifting weights, facing problems head-on, or in any other way.”Pain + Reflection = Progress. How big of an impediment is psychological pain to your progress? Bad : Avoid facing harsh realitiesGood : Face harsh realities“People who confuse what they wish were true with what is really true create distorted pictures of reality that make it impossible for them to make the best choices.”“People who know that understanding what is real is the first step toward optimally dealing with it make better decisions.”“Ask yourself, “is it true?””How much do you let what you wish to be true stand in the way of seeing what is really true? Bad : You worry about appearing goodGood: You worry about acheiving the goal“People who worry about looking good typically hide what they don’t know and hide their weaknesses, so they never learn how to properly deal with them and these weaknesses remain impediments in the future.”How much do you worry about looking good relative to actually being good? Bad: Make their decisions on the basis of first order consequencesGood: Make their decisions on the basis of first, second, and third order consequences“People who overweigh the first-order consequences of their decisions and ignore the effects that the second- and sebsequent-order consequences will have on their goals rarely reach their goals.”How much do you respond to first order consequences at the expense of the 2nd and 3rd order consequences? Have clear goalsIdentify and don’t tolerate the problems that stand in the way of your goalsAccurately diagnose these problemsDesign plans that explicitly lay out tasks that will get you around your problems and on to your goalsImplement these plans, do these tasks. You must approach them as distinct steps, not blend them together. When setting goals, JUST set goals, don’t think about what’s in their way. Blurring the steps leads to worse outcomes because it creates confusion and short changes steps.Each of the five steps require different talents and disciplines. You must diagnose and address your weaknesses in the process, too.It is essential to approach this process in a clear-headed, rational way rather than emotionally. A good way to stay centered and not get too emotional in evaluation, is to treat your life like a game. How do you get around challenges to reach your goal?